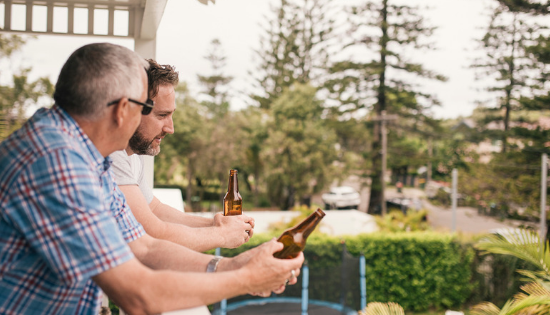 According to a recent report written by Dr Claire Matthews – Director of Academic Quality at Massey Business School, there’s been a heightened generational interest in retirement planning in recent years. What do you need to retire, not just at a basic level, but if you want to have choices? The NZ Herald reviewed the report in kind and found “A couple living a no frills lifestyle in the provinces were able to get by mainly living on NZ Super but would still require a lump sum of around $13,000 at retirement to fund their spending”. The biggest differentiators between provincial and metro savings were food and recreation. In cities, people spend more on recreation and food which might be a reflection of the opportunities they are presented with but could also reflect an urban/rural wealth divide – meaning you should be planning according to not just your aspirations but taking into account your environment. The report also mentions retirees spending today exceeds the NZ Super supporting them, which reinforces the message that to prepare for the retirement you want, it’s never too soon to start saving. That means in order to prepare for a comfortable standard of living in retirement, most Kiwis will need to provide supplementary income, additional to what their Superannuation scheme can provide. 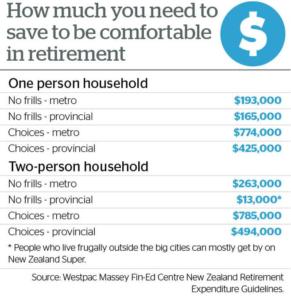 Chart “How much do you need to save to be comfortable in retirement” source: NZ Herald.